ABOVE: A pie-billed grebe was injured when it mistook pavement for water. Most migratory birds that come into our Center for help are water birds who land because of fatigue, collision with power lines, or difficult weather. Many Eastern Sierra residents are familiar with the phenomenon known as migration. Almost everyone sees the "Caution: Deer migration" signs along the highway. Some people hang or put away hummingbird feeders as the tiny speedsters come and go. Sky-watchers thrill to large groups of white pelicans or "kettles" of turkey vultures heading north or south. Recently, Wildcare Eastern Sierra admitted two water birds whose migratory journey was interrupted. A juvenile Pied-billed Grebe, a diving water bird, landed on the pavement behind the Auto Club building (grebes and loons, while migrating, often mistake pavement as water and land for a rest. They are unable to take flight from land.) The grebe was unlucky and ruptured an air sac during his hard landing. When attempting a test swim in the Center's bathtub, the injury caused him to turn and float on his back! He has been transferred southward to Pacific Wildlife Project where he can continue to heal in their specialized water bird environment. A young white-faced Ibis, a wading bird of the marshes, chose to land in a lush green segment of pasture in Hammil Valley. No doubt he mistook it for a marsh. 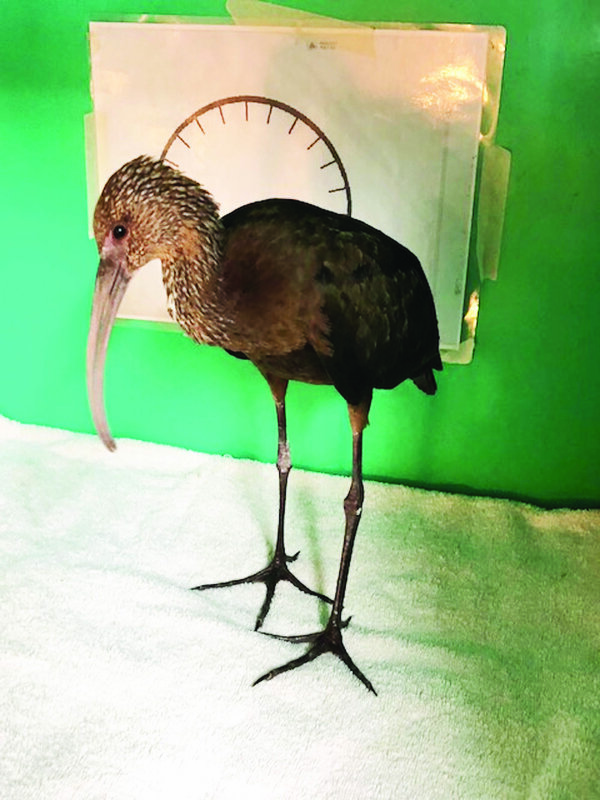 The Ibis, alert and healthy, was transported to the marshy shores of Klondike Lake following his mishap. Migration is defined as "seasonal movement of animals from one region to another." It is practiced by birds, fish, land and marine mammals, and some insects. The Eastern Sierra lies in the path of the Pacific Flyway, a major north-south flyway for migratory birds in America, extending from Alaska to Patagonia. Every year, migratory birds travel some or all of this distance both in spring and fall, following food sources, heading to breeding grounds, or traveling to overwintering sites. Any given bird species travels roughly the same route every year, at almost the same time. Migration is a natural part of many birds' lives, but it is fraught with danger. Tiny songbirds can migrate hundreds of miles a day, flying three times faster than normal. Most birds migrate at night, navigating by the stars. Exhaustion, starvation, inexperience, predators, natural disasters, collisions, wildfires, hurricanes can affect the success of a bird's migration. Both the grebe and the ibis were juveniles so this would be their first migration. They were in good healthy condition so perhaps sheer inexperience caused them to land in inappropriate places. Most migratory birds that come into our Center for help are water birds who land because of fatigue, collision with power lines, or difficult weather. If you spot a water or wading bird on roadsides, in parking lots or other unusual spots, they most likely need rescuing. We also see songbirds and raptors that are injured by collision with lighted windows or attacked by predators such as cats, dogs or birds of prey. Can we do anything to help our feathered friends on their travels? We can be bird-friendly all year-round, creating bird-friendly landscaping and preserving natural habitats for rest and refueling. Feed birds all year-round. Choose native plants and provide a water source. Healthy nutritious food such as suet, black-oil sunflower seeds, nuts (and nectar) provide high amounts of fat and sugar give bird energy during migration. Wash and disinfect feeders to prevent disease spread and rake up old, moldy seed from beneath feeders. Prevent window collisions. A flock of Cedar Waxwings (migrating at night) flew into a lighted picture window (no drapes or blinds) in Benton. Nine birds died; only one survived and came to us for rehabilitation.) During the day, hanging ribbons or shiny computer disks can warn birds of hard-to-see windows. At night, pull your drapes or blinds. As always, avoid other hazards such as open containers of used motor oil or other liquids, bird netting or Halloween "cobwebs," sticky fly or glue traps, rat poisons. Watch your feeders for visiting migrants, keep watch for stranded birds on roads and parking lots, and your eyes on the skies for the magnificent sight of a flock of white pelicans soaring in the brilliant blue. Rufous Hummingbirds migrate nearly 4,000 miles. The Arctic Tern travels 44,000 miles from Greenland to the shores of Antarctica. We humans no longer migrate, as our ancient ancestors did, but we can sharejust a little bitthe fascinating travels of our feathered friends. Living with Wildlife is a program of Wildcare Eastern Sierra dedicated to helping the people of the Eastern Sierra live in harmony with our wild neighbors. This column appears monthly in the Inyo Register. For further info, call Executive Director Cindy Kamler at (760) 872-1487. More than 80 percent of the injured wildlife – birds, mammals and reptiles – brought to Wildcare Eastern Sierra have run afoul of a vehicle. Here are six tips to avoid causing them injury. Some photos of a rare baby Sora, a member of the Rail family, in our rehab. Late on the 22nd, Mammoth visitors rescued that turned out to be a Great Gray Owl found near Lake Mary Road and the Equestrian Center.